In performing auto restorations, we find ourselves with many decisions and often have to make tradeoffs between authenticity and availability of hardware. When do we settle for just what is available from a vendor or supplier? What length do we go in order to achieve a certain look or present our finished project as best of one's ability? With acorn nuts for example, you have to consider thread size, width dimensions (aka on-the-flats), height, shape-curvature of the nut's dome, and material used. We examined all these features on acorn nuts supplied by various vendors, but to no avail. Some had the correct thread size, but wrong dimensions on the flats and the dome was not right. This article examines the making of special acorn nuts when the desired size and shape were not readily available and the highest authenticity was being sought. Side-by-side comparison of the acorn nuts that were available from various vendors. All had 7/16-20 threads, but none has the correct shape. 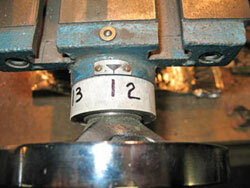 The process begins by establishing the design and documenting each dimension required for the machining process. We prepared a drawing taking precise dimensions of existing hardware using common measurement instruments and radius gauges. The design also includes a 0.0625 (1/16) inch relief cut into the base to minimize the nut's hex edges chipping paint when tightened, a design detail not found on the original. The inside curvature had a concave radius of 0.187 (3/16) inch and the dome had a convex radius of 0.250 (1/4) inch. Fortunately concave and convex cutters in these sizes were readily available from machine tool suppliers making the job easier. For the material, the 0.6875 (11/16) inch on the flats Hex stock in a steel alloy material called 12L14 was available from Speedy Metals, a supplier accustomed to selling materials to the home machinist. 12L14 is used extensively in automatic screw machines for manufacturing numerous parts requiring considerable machining and close tolerances, along with a smooth finish. 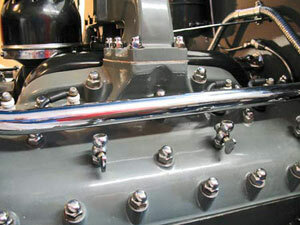 12L14 can be used to maximum advantage where considerable machining is required, such as bushings, inserts, couplings, and hydraulic hose fittings or in this case acorn nuts. 12L14 has a tensile strength of 78,000 PSI and a Brinell hardness of 163 and from previous experience, it machines quite easily. Final drawing of the Acorn nut. It documents the dimensions needed for machining such as the relief cut on the bottom so the Nut's hex sides don't catch the paint on the surface and the radii of both the convex and concave curves. Projects such as making these acorn nuts requires some planning on the steps needed to make best use of your time along with tools available. As the hex stock is supplied in long lengths (six feet for ease of shipping), the first task was to cut a long six inch segment to create a threaded mandrel required for some of the machining steps. Next, holding the stock in place by using the lathe's three jaw chuck, use a standard lathe cut off tool to cut the hex stock into forty eight 1 inch segments. While only forty four nuts are being machined, having a few extra segments already cut is useful in the event of an error occurring. The mandrel's tip is turned down to the required dimension to run a die down its shank and the threads must go all the way to the base. After the mandrel has been created it is set aside until needed later. Each 1 inch segment is chucked up and the end is faced to square it off followed by cutting the 0.0625 (1/16) inch relief on the nut's bottom. 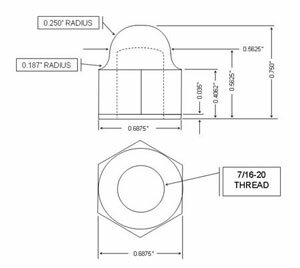 The next steps for each segment are 1) drilling the centering pilot hole, 2) drilling a 25/64 inch hole, and 3) tapping the hole for the 7/16-20 thread using both taper and bottoming taps. 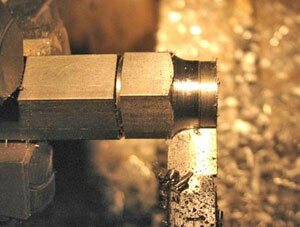 For these procedures use the lathe's Tail Stock holder. Each hex segment should be trial fitted on the mandrel to ensure good fit and that it threads all the way to the mandrel's base. All segments are drilled and tapped before proceeding to the next step. The hex stock segment is held in the lathe's three jaw chuck and an angled cutter is used to cut the relief cut into the Acorn Nut's base. Next, the mandrel is chucked up onto the lathe and each segment is wrench snug tightened for each of the following steps. The upper portion of the acorn nut is turned down to a diameter 0.5625 inches and stopping at 0.5625 inches from the base. The base dimension becomes important to ensure ample material can be cut from the hex segment when using the convex cutter. 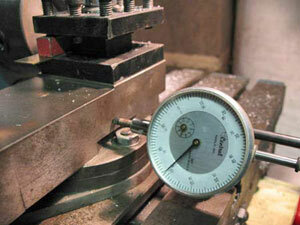 A dial gauge is set up to monitor this dimension when turning down each segment. The process can become a little tedious, so to minimize any mistakes, we divided this process into simple, repeatable steps. It was determined that four passes of the cutting tool would be necessary to turn down the segment. We marked the cross feed indicator with four numbers, 1, 2, 3 and 4. We used a strip of masking tape (or your could use a wide rubber band) on the cross feed table indicator to make quick reference to cutting positions when turning down the hex segment. Pencil marks directly on the indicator wheel also provide the same function. A dial gauge having a magnetic mount is placed on the lathe's bed and calibrated to the cross feed table to indicate when the cutter has reached the required depth. A strip of masking tape on the cross feed table's indicator with marks from a Sharpee marker makes referring to the table's position easier. If masking tape doesn't stick, a wide small diameter rubber band (lobster claw band) can also be pulled onto the round indicator and marked up with the Sharpee and discarded when this step is completed. 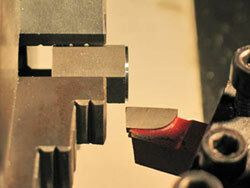 The final machining steps are to use the convex and concave cutters. 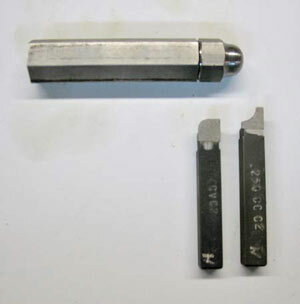 Since these cutters are used in succession on each segment, they are mounted on the lathe's rotating tool head opposite to each other. This facilitates changing between cutters easy; just unlock and spin the tool post. The first used is the convex cutter to achieve the 0.187 inch radius at the top of the nut's hex base. The second photo below shows the cutters side-by-side and how they would cut the required convex and concave curves for the acorn's "bell" shape; the next photo shows side-by-side comparison of an original, a machined nut, and the finished acorn nut as it came back from the chrome plater; and the last photo reveals the real significance to this nut project. 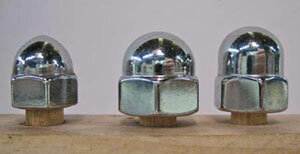 The head nuts and the manifold nuts have the same "bell" shape and should match each other even though they are different sizes. The hex segment is tightened on the mandrel while the convex cutter is used to cut the 0.187 inch radius curve into the hex base. The mandrel and a hex segment are shown with the convex and concave cutters in their relative positions on how they would cut the inside and outside curves of the acorn nut. Side-by-side comparison of the acorn nuts. Left is the original, the middle is the nut as it was machined and on the right is the acorn nut as it came back from the chrome plater. The significance of making these acorn nuts becomes clear in this final engine photo. The manifold acorn nuts and the head nuts have the same "bell" shape and should match even though the manifold nuts are a smaller size. Machining these forty four acorn nuts for the head and the twelve smaller ones for the intake manifold took cumulatively over 30 hours over several winter nights. One might say this was a nice winter project to do while in the comforts of a basement shop, but the real motivation was to match the acorn nuts. Lincoln owners would certainly take notice. There are several different ways to make these acorn nuts and the steps presented here are ones we've used with success in the past. Stainless steel could have been used if available in the right Hex size. A special profile cutter could have been fabricated to cut the convex and concave curves in one step, but that would have taken more time to make than it was worth for this one time project. Breaking down a project like this into phases helps with preventing monotony and fatigue. Perform the same procedure during each phase like the drilling and tapping phase and take breaks between set up of the next phase. Make extra blank segments in the beginning in the event of a mishap during a cutting or drilling step. Since set up consumes so much time, having these available already drilled and tapped would be helpful. Basic machining skills such as proper lubrication, lathe speed, tool cutter alignment, taking light passes off when turning down material, and use of the Tail Stock are assumed before tackling a project such as this. Despite the complexity, this is just a a series of simple steps that can be accomplished by someone having minimal experience.